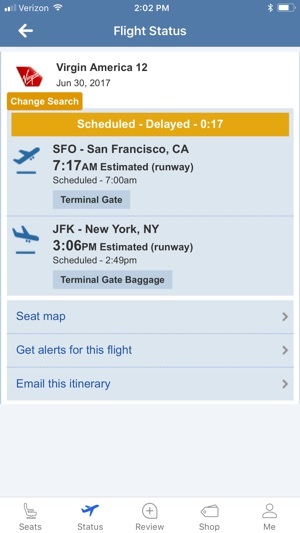 Find low airfares, pick your ideal seat on the plane, and get real-time flight status alerts with the SeatGuru® app. We have rolled out redesigned seat maps with improved seat and amenity information. The updated seat maps also have a new photos section with seat and cabin pictures from our SeatGuru community. 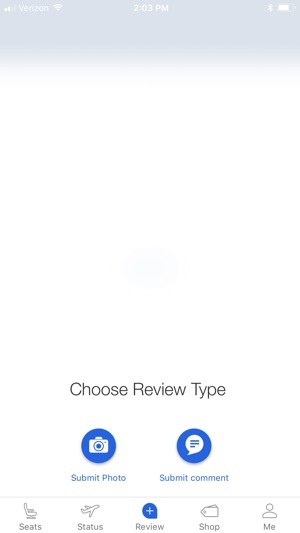 And now you can easily submit your own seat reviews and photos right from your phone! 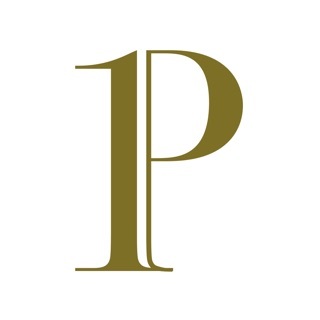 All from the ultimate source of advice on airplane seats, in-flight amenities and airline related information. Whether you're at the airport or on the go, SeatGuru is the must-have travel companion for anyone who flies. The SeatGuru app lets you access over 1,100 seat maps from approximately 140 airlines. It features advice and insights drawn from tens of thousands of passenger reviews, so you can always find the best possible seat for your flight. Search the Web’s widest selection of airline seat maps to help you find the best seat on your flight. Powered by TripAdvisor Flights, shop a wide selection of airlines and online travel agents and find the right flight and the lowest fares for your travel needs. Check the status of your flight, so you can stay informed of any delays or cancellations. Know what to expect by seeing seat photos before you fly. 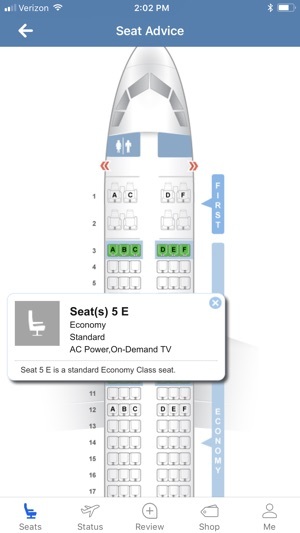 Browse through available pictures of seats and cabins from other SeatGuru flyers on the Seat Map page. Share your insights with other flyers. 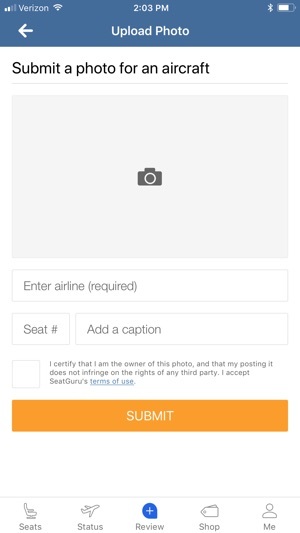 Add your own seat photos and reviews to SeatGuru from your phone, so other travelers can also have a great flight. SeatGuru is available for download in the Apple App Store and is powered by TripAdvisor®, the world’s largest travel site. 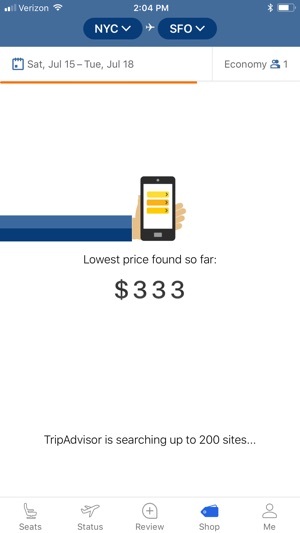 SeatGuru.com and the SeatGuru app give travelers the information they need to make better and more informed travel decisions by providing comprehensive, extensive, and trusted seat recommendations and airline advice. The new zoomed plane models on this app destroy the purpose of this app, how long will it take before the people in charge of the app get it through there heads that what they had did not need changing! I believe whole-heartedly that the new zoomed-in plane models are absolutely terrible and do not accurately represent the plane models, I want to know what my plane will look like, and not just a cartoon. This needs to change soon, I’m getting tired of this non-sense. While I wait for that to happen, I will hold onto the few remaining airlines that have their plane models in the original form. If it isn’t broken, why waste the money to change it. Wrong airplane seat configuration over 80% of the time now! I fly internationally at least 2 to 3 times per month and used to get very accurate, useful and easy to find seat data that was extremely helpful. Not sure what happened, but nothing else matters if the airplane and seat configurations are wrong. I just looked for a flight I have today on Singapore from Dubai to Shanghai and then a flight next month on United from Houston to Narita and none of the multiple configurations they list are correct. Unless they can get accurate data soon,I will no longer use this app. I use this app a ton when deciding which routings to take based on aircraft. One feature I would love to see would be the ability to be able to pin your favorite airline(s) to the top of the “Browse” list under the Seats tab or for there to be a favorites tab added to the bottom of the screen.